A weekly meme where readers share the first sentence of the book they are reading and say what they think. Hosted by Gillion Dumas of Rose City Reader. While it is obvious from the opening sentence that the novel opens at a crime scene, just what occurred is still a mystery. One I am anxious to find out. The above takes place right after the main character George had an unwelcome encounter. This particular excerpt struck me because it isn't often I read about a grown man so afraid--or relieved--he wants to cry. I thought it was a nice touch. I am not too far into Peter Swanson's The Girl With a Clock For a Heart, only about a quarter of the way in. I haven't much of a chance to read this week, unfortunately. Hopefully this weekend I will be able to make up for it. This week's topic is Bookish Gift You'd Most/Least Like to Receive. Would a gift card to a bookstore for an unlimited amount of money count as a bookish gift I want most count? A booklover can dream, right? I have had my eye on something like this for awhile now. I am just not sure where to put it if I did receive it, and I am pretty sure my husband is looking at me like I'm crazy right about now. Or, more realistically, I would take an annual subscription to a book box. My favorite one is My Lit Box, featuring authors of color. The book selections are awesome and the goodies are always a fun surprise. If the gift giver didn't want to save me money on something I am already subscribing to, he or she could try another subscription book box. There are some pretty good sounding ones out there! I like purses. And I love totes with bookish themes. I might not even mind a purse with a bookish theme. But, I confess, I am not a fan of purses made out of books. I'm just not. Even when I like the book it's made from. What bookish item would you most like to receive? What bookish item would you least like to receive? When you enter an unfamiliar house or apartment for the first time, do you feel disappointed if you don't see any bookshelves, or books on the coffee table? No, I would not be disappointed if I didn't encounter books on shelves or on a coffee table upon first entering an unfamiliar house. I would be be elated if I did, however, but it isn't something I would expect or necessarily need to see. Chances are, I am there for another reason--not to look for books. Not everyone feels the need to keep books out in the open. The real question is whether I would be able to resist looking at any books if there were any around . . .
1. If someone were visiting my area, I would recommend a visit to so many places: the beach to see the Pacific Ocean, the Mojave Desert, San Diego, Disneyland, Lake Arrowhead in the mountains, and the Getty Museums, both the one in Malibu and the other in Los Angeles. And that's just for starters! 2. My favorite room in my home is my living room personal library. Who doesn't like to be surrounded by books? Plus, the couches are comfy and it's the perfect place to settle in and read for a little while. 3. Back-to-school time makes me think of the beginning of the new soccer season, the coming of fall (just over a month away! ), and homework--lots and lots of homework. 4. My favorite year of school was fourth grade because that was the year I discovered my love for writing. Anne - I have too, although it's rare I come across a male character feeling that way in a novel. Thanks for stopping by! I want that Jane Austen purse. That's the only Swanson book I haven't read and I'm anxious to read it. I love your library!! Kathy - I look forward to reading his other books. I have heard they are even better. Thank you for stopping! The Girl with a Clock for a Heart sounds excellent. I love the look of your living room. I'm reading White Hot by Ilona Andrews this week. Happy reading! Enjoy White Hot! Thank you for visiting! - Page 56, The Gospel Of Loki by Joanne M Harris. I think almost all book lovers would take the hand off anyone giving them a book token. For myself, a book mark is also always gratefully accepted. I'm with you on that Jane Austen bag though and not just because I'm not a fan. Tracy - Thank you for sharing, Tracy. I haven't read anything by Joanne Harris before. I like your teaser though. Thanks for visiting, Tracy! I hope you have a great weekend. Oh, I love that cozy library! And yes, the couches are the perfect place to curl up and read. While I don't have one room with all of my books (a wish I have), I do have two or more bookshelves in each room. Love the sound of your featured book. I've seen that one around, but not in a while. Now I am intrigued again. Thanks for sharing, and for visiting my blog. Laurel-Rain - It is very cozy. :-) It's my favorite place to read, followed by my bedroom. 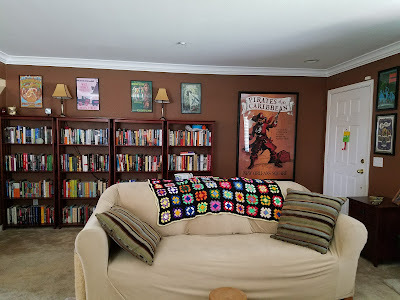 I have bookshelves in other rooms as well--they're in every room just about. I have way too many books. I agree on the "no books" in the house thing. It's cool to see them, but I generally not there to check out the books, so I don't really notice them. It's always nice to find books in other people's homes, but definitely not necessary. What great answers! I loved reading, but atually found a love of writing in middle school. I have been to San Diego once, and loved the Pandas at the Zoo! Babies! Thanks for joining us. Your blog is awesome. Hugs. Great answers to the Friendly Fill-Ins too. Thank you for stopping by today, Elizabeth. The book you are reading does sound interesting I like your idea of a perfect book lover gift. And I am with you, no purses made out of books. Thank you for participating in the fill-ins, great answers. I love your living room/library, it does look like a nice place to relax. Have a great weekend! Hope you get some time to read. Thank you. It's one of my favorite rooms in my house. I hope you have a great weekend too. Thanks for visiting! I love Jane Austen and that purse looks really cool but I don't think I would want one made out of a book either. I think if they could make the print onto leather and make it that way I would grab it...lol. Stormi - Yeah, I don't think a purse like that is for me. I agree about making a print onto leather. I would much prefer that too! 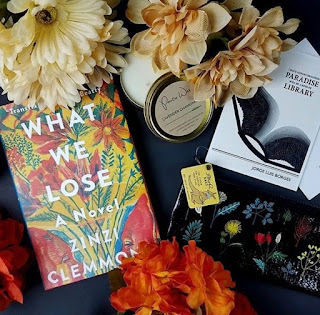 I would love to get a book subscription box as a gift! I got one for my birthday last year and it was awesome. :) As for book purses..nope! I love purses and bookish themes, but I think a purse made out of a book is just a little too much for my personal taste. Thanks for visiting earlier! Gennifer - I love my lit box. :-) I'm with you about the purse made out of a book! Thanks for stopping by, Gennifer! Yes, a book gift card would be awesome with unlimited funds!! Sign me!! Can you imagine how much we could by with an unlimited gift card? The Girl with a Clock for a Heart was disappointing for me, especially the main characters, who appeared unbelievable. I hope you finish and like it though. Harvee Lau - I am sorry to hear it was disappointing for you. I admit I am not too happy with George right now. Thanks for visiting! Ashley - It caught my attention too! Thanks for visiting! I hope I can one day have an awesome room like that filled with books, looks so cosy! Similarly I don't feel disappointed, but it is always a lot of fun to see what other people enjoy reading. Tas - It was a dream come true for me. :-) Now to find a way to build a hidden room . . . Just kidding. I feel the same way about entering an unknown house. I would have been scared if I entered an unknown house! You have me interested for more!! Happy weekend! Freda - It definitely is interesting. :-) I hope you have a great weekend too. Thanks for visiting, Freda. I read, and enjoyed very much, The Girl With a Clock for a Heart! Hope you do too when you get a chance. Love your personal library-- oh so comfy and relaxing in there! Rita - I am glad to hear you enjoyed it! So far, I am enjoying it, although George has been annoying me a bit. I hope you are settling well into your new home! Thanks for stopping by, Rita. The beginning of the book doesn't give me much, but I've heard a lot about this book. I've resisted so far. However - I hope it's a good book for you. Margot - I've heard such good things about Peter Swanson's book, although more about his later ones. So far, I am enjoying this one. Thanks for visiting, Margot! 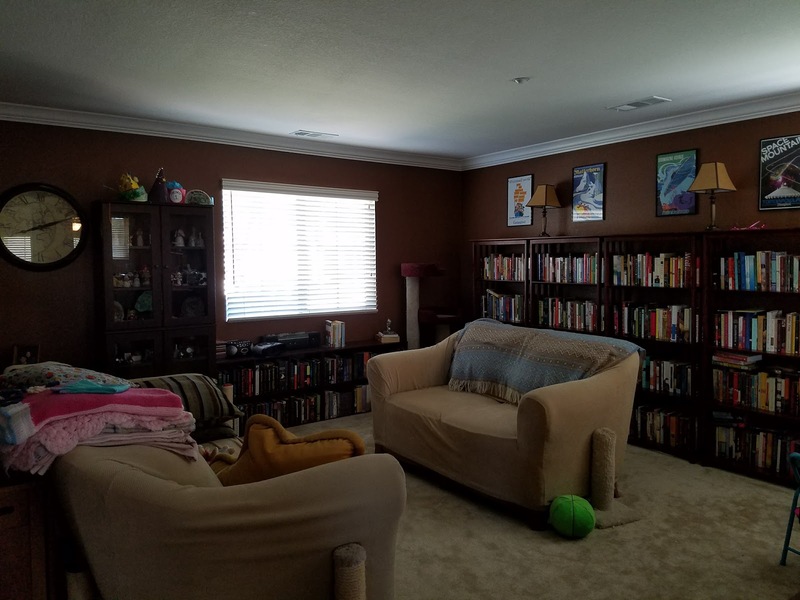 I love your living room/personal library! Thanks for sharing. It looks so cozy. Nicole - Thank you! It is very cozy. :-) Thanks for dropping in. I really like the cover as well. So far I am enjoying it, although the main character doesn't make the smartest of decisions. I keep reminding myself there wouldn't be a book otherwise, but still. Haha Thanks for stopping by! I would love a shirt from Litographs if I were to receive a bookish gift. I think they are just really neat. I might have to buy one for myself soon. They make great shirts, so I can see why! Yeah, I also feel drawn towards a bookshelf if there is one there. I agree. You don't often see men give in to their emotions so readily. I find it refreshing. Loce tvat Jane Austen purse so much. Alicia - I find it refreshing as well. Maybe someday you will receive a purse like that. :-) Thanks for stopping by! I definitely want more bookshelves! Then again, that also means more books to buy and the cycle will begins all over again, lol. That Jane Austen purse is lovely, but I don't think I'll carry it around as it's too eye-catching. Probably more like a collection. Melody - Yes, the risk of having more bookshelf space is more books and then pretty soon you need more shelves . . . I'm already overflowing again and really need to weed out books for donation. I just need to find the time and motivation! Thanks for stopping by and commenting, Melody! Oh, Wendy, what an AWESOME post!! LOVED reading it, and seeing all the pics!! I'm with you on the preferred bookish gift!! ABSOLUTELY!! Although I'm running out of shelves now.....Lol. 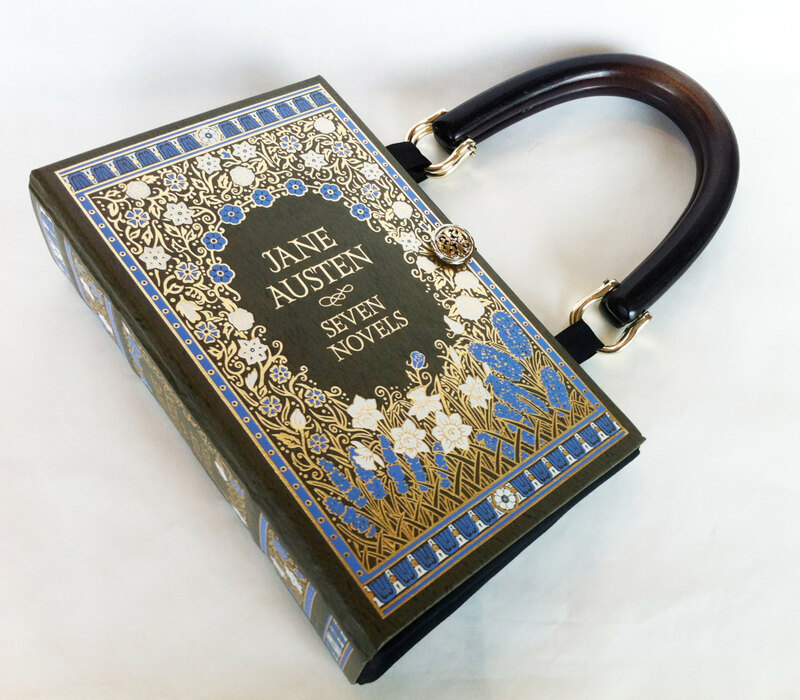 As for the least preferred gift, I have to say that I would LOVE to get a purse that sported a classic book cover. NOT one made FROM a book, of course! I don't like the idea of actual books being "altered" in any way!! GRRRR!!! But a purse with a PICTURE of a famous classic cover, yeah, I'd LOVE that!! That's a GREAT meme, by the way! I need to go check it out!! Nice answer to the BBH question!! I'm glad you wouldn't feel disappointed if you didn't see any books in someone's living room, when visiting for the first time. Of course, like you, I would be totally unable to keep from checking out their collection! Lol. OMG, what AWESOME pics of your living room!!! 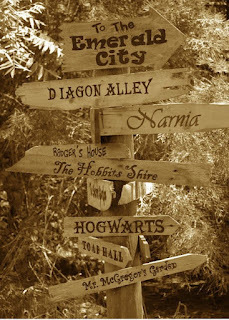 I would LOVE to visit you!!!! LOVE, LOVE, LOVE those bookcases, as well as those SUPER COZY couches!!! Oh, Wendy!!!! You actually have a BOOK HAVEN there!!! I'm feeling SO EXCITED just looking at these pics!!! Yeah, I know, I'm a TOTAL BOOK NUT!! Lol. But hey, Mouse is SO FREAKING LUCKY to have parents that LOVE books this much!! Lol. 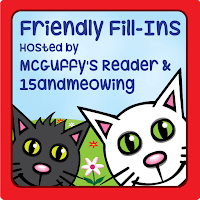 Thanks for sharing all of this GREAT bookish stuff, Wendy!! MI CASA ES TU CASA!! (My house is your house!!) LOL!!! Maria - Thank you for your kind words, as always. :-) I enjoyed Peter Swanson's book, although I am not sure I would say I loved it. I do want to read more by him though. I really need to organize my shelves and donate some of my books to make room for newer ones that have come in that I want to keep. Finding the time is always a challenge though. And I have to be in a certain mood or else I won't let any of my books go. I would hope that the books used for purposes of art or to make into purses are already falling apart and fixing them would be next to impossible. Otherwise, the idea makes me cringe too. I like the 50/50 meme. It doesn't seem to have a large audience, but it's simple to throw together (and they list the topics in advance, which is a big plus for me!) so I thought I would give it a try. I've been experimenting a bit lately and somehow am posting more than I have in the past now. I'm not sure I can keep it up. We'll see! Oh I love your library! Plus, Peter Swanson's book - I haven't read that one, but I do have another one of his sitting on my shelf unread... I must catch up! Sassy - Thank you! It's my favorite room in my house. :-) I am looking forward to reading more by Peter Swanson. I have heard his other two books are even better. Thanks for visiting! An unlimited gift card to a bookstore. That is the dream right there! That would be glorious! You make a good point about the quote -- it isn't often a grown man is the one feeling like that about crying. I love LOVE the idea of an unlimited card to a subscription box -- they are brilliant! Verushka - Especially in books, I think. At least not in the books I read. It's good to see an adult male character portrayed in that light. I love your living room/personal space/library! I might need to think about getting all of my books into one place instead of in rooms all over the house. I'd keep reading The Girl With a Clock For a Heart, the excerpts are interesting. The Lit Box sounds nice and I have a Nancy Drew book/purse I won on blogland ages ago somewhere around here lol. I know, it's not very eye catching. For myself, I'd love someone to gift me an autographed Stephen King book addressed to myself of course. I'd least like YA or religious books as gifts, not a fan of those genres. Ah, your personal library looks so cozy! Enjoy and have a great week! Naida - I enjoyed The Girl With a Clock For a Heart. Now I need to find time to write the review. :-S I'm so behind! An autographed Stephen King book would make an awesome gift! 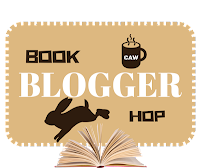 Great blog hop answer and so true! Thank you so much for stopping by my blog hop.